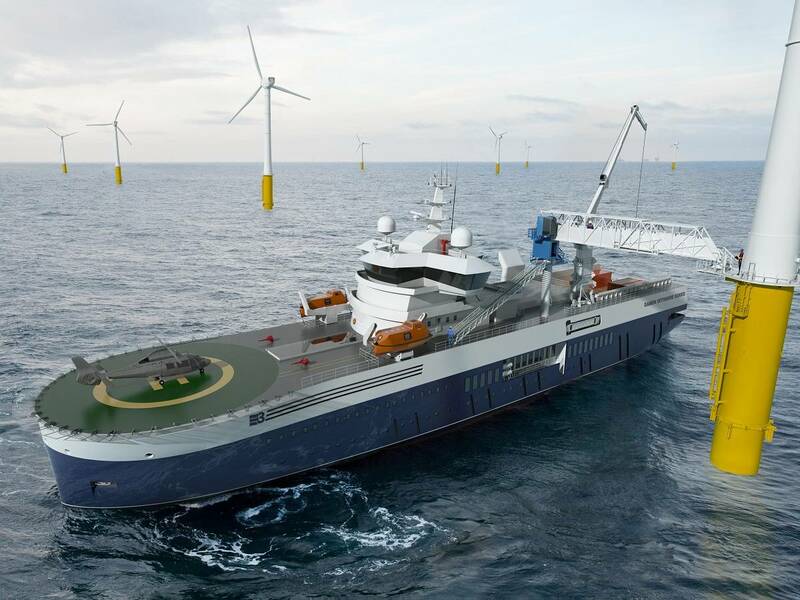 After making final touches to the Damen Walk 2 Work vessel, a completely new and innovative design for the offshore support vessel market, Dutch shipbuilder Damen decided to start building the vessel on speculation, marked with the start of the basic and consequently detailed engineering of the vessel. The vessel will support and accommodate turbine maintenance crews at sea. Not only provides the vessel on-site work facilities and accommodation for voyages of up to one month, the vessel also comes with a helicopter platform, daughter crafts and has an 80% weather operability in the Central North Sea Area. Since the ‘E3’ are becoming more and more important, Damen started about a year ago with the search for a way to create and design a vessel which is Environmentally-friendly, Economic viable and Efficient in operation (E3). The key design criteria for the vessel were the result of extensive discussions Damen held with the industry. Staff retention was a growing issue in the offshore market. Therefore a fourth requirement was given: comfort for crew and its passengers. The vessel is a monohull with bridge located amidships. It has a length of 90m and a beam of 20m. The Damen WSV will feature 500m2 of deck space, approximately 400 m2 internal storage space, a helicopter platform and a motion and heave compensating crane and gangway. Its shallow draft optimizes comfort, while also conferring significant power savings. The Walk-to-work WSV is especially designed for the North Sea area of operation. The vessel is is capable of gaining access up to 80% of the time in the worst case scenario in the Central North Sea area. This result can also be achieved when the worst single failure is occurring, a main switchboard failure, on board the vessel. This performance results in an accessibility of more than 95% in many areas were offshore wind farms are being built. According to Damen, the effects of this new and innovative design are: greater turbine availability, less lost production and less direct O&M costs against a higher profitability of the wind farm. This vessel is contributing to about 25% reduction of O&M cost of an average large size wind farm. The optimal comfort for crew and passengers is determined by designing the right hull form and the right positioning of the accommodation. Damen has been able to reduce vertical and horizontal accelerations significantly. A significant reduction of accelerations has been achieved throughout the vessel up to 30% in the , accommodation. This achievement highly improves the level of comfort, safety and workability on board. The vessel, as a result of this design effort, performs well within the motion criteria as set by the industry. When considering noise and vibrations, bow thrusters noise emission can be mitigated, but it is relatively expensive to do so. Many of these considerations has been input for the design-phase of the vessel, resulting as well into easily complying within the industry set criteria at limited cost. Adding up to the level of comfort is the extensive ergonomic studies carried out resulting in crew and turbine technician cabin dimensions of well above the minimum set requirements by law. Of course the vessel has a fitness center and internet/movie services. By extensively analyzing the flow of personnel with all their different tasks on board the vessel and the flow of spare parts and other equipment, Damen was able to map the public spaces for efficient workflows and storage. Having an optimized design based on the right Ocean conditions results in the fact that expensive compensation systems are not needed. The hull-form resulted in an average of 25% less installed power to reach the same speed. When considering DP operations and power output, significant less thrusters output (20%) is required because of the positioning of the accommodation. Damen also developed a fuel consumption tool in which total fuel consumption of the vessel in various operational conditions in a specific area can be calculated. This tool gives a good indication of what can be expected on a yearly basis given a certain operational profile. So altogether, every effort has been made to reduce the vessels total cost of ownership, the shipbuilder said. The transfer of maintenance personnel and equipment is one of performance determining functions of the entire ship. Being able to continue the work flow in the prevailing wind conditions and waves, forms the biggest challenge. The design questions are based on the selections of the components like the access systems and, the choice of the DP system, the positioning of these systems on board and a smart integration. Characteristic for these systems for crew and cargo transfer on offshore vessels is that they operate independently of the control systems for the dynamic positioning of the vessel. This innovation, the Transfer Positioning System (TPS), aims to increase employability by design integration and share system integration at the heart of the design.